We are located in South West British Columbia, about 15 minutes from the US border. We have been breeder/owners of Miniature Donkeys since 1977 and continue to be captivated by these fascinating animals. It's true - Miniature Donkeys are addictive! We have a selection of registered Jacks, Jennets and Geldings of all colours representing many of the finest bloodlines known. Our goal is to raise correct, show quality animals that also make wonderful pets. 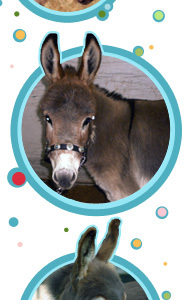 We welcome inquiries from any and all interested in Miniature Donkeys. We love to share our donkeys! Coming soon- more donkeys for sale!